Redeem at :http://frch.in/fcharge. Code valid only once per debit/credit card & user. 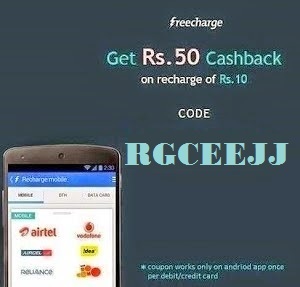 Freecharge offering Rs.50 cashback on Rs. 50+ Mobile recharge for New Mobile app users. Rs.50 Free Mobile Recharge Gift – Paise kya ped pe ugte hai? -Yes ! 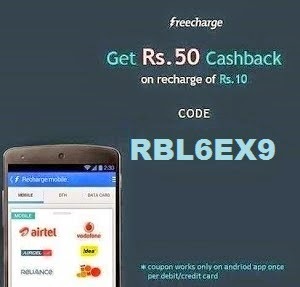 So use FreeCharge promocode RBL6EX9 & get Rs.50 Instant Cashback on your next Mobile Recharge. Redeem on : http://frch.in/refer. Code valid only once per debit/credit card & user. Your means of telling the whole thing in this post is actually pleasant, every one can easily understand it, Thanks a lot.